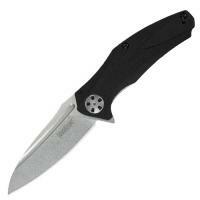 The Kershaw 7007 Natrix is a tough folding knife that offers heavyweight performance despite its light weight. Its Sub-Frame Lock design uses an integral steel plate to lock the blade into the open position, allowing the knife to feature a large blade at a low overall weight. The drop point shape features a sharp tip and long plain edge for versatile performance. It deploys using a one-handed flipper mechanism, backed up by a SpeedSafe assisted opening system that provides extremely quick and easy deployment. The handle is shaped to fit securely into the hand, and its lightweight G-10 material is naturally textured for a non-slip grip. It features a deep-carry pocket clip for portability.